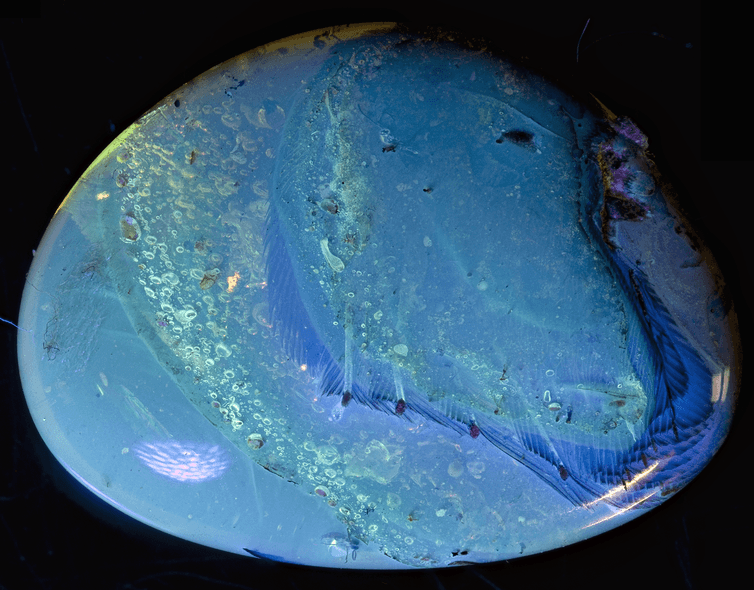 Fossilised amber is like a time capsule, a snapshot into a world millions of years old, and ancient creatures discovered in this amber give us fascinating insights into the past. The amber deposits of north-east Myanmar (Burma) have become famous for thousands of fossils that preserve an astonishing array of plants, insects, spiders, scorpions and lizards from the Cretaceous period that were unfortunate enough to become trapped in the sticky sap of ancient trees – sap which over millions of years becomes amber. 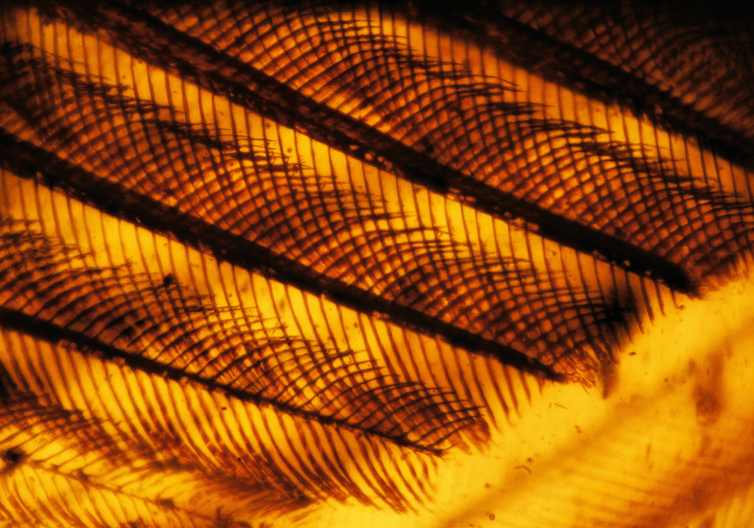 Rarely, collectors have found isolated feathers, and even more rarely parts of ancient birds. Xing Lida from the China University of Geosciences in Beijing, together with a large team including myself, are among those to make such a rare discovery: two tiny fossil wings preserved complete with feathers, as detailed in a paper published in Nature Communications. 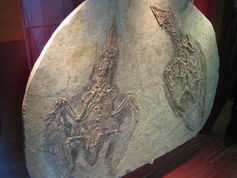 Unlike the even more famous fossil birds from the Jehol Group of north-east China that are preserved only as imprints in stone, these Burmese fossils are three-dimensional, the first ever discovery of not only the bony skeleton of the wing, but also the feathers in their original arrangement and even the underlying skin. The two wing fragments from two juveniles of the earliest types of birds are each only around one centimetre long, but following CT scanning the bones are clearly visible. Attached to the back of the ulna and metacarpals – the bones that would in a human be the forearm and fingers – are nine primary and five secondary flight feathers, evenly spaced, and in their original positions. These feathers are asymmetrical, with a vane (the feather’s body) of unequal size to either side of the quill, the feather’s central shaft. This asymmetry is usually interpreted as evidence that the feathers were used in flight. Just as with feathers from modern birds, when examined in detail the feathers reveal barbs – the ridged formations on a bird’s feathers – and barbules – tiny hooks on the barbs – that allow the separate feathers to “zip” closely together to form a continuous flight surface so the bird can fly. It also enables ruffled feathers to be preened and smoothed back into shape. There are even visible traces of plumage colour – light and dark patches – but it’s impossible to explore the chemistry and potential original colours while the feathers are entirely encased in amber. The anatomy of the bones shows that both specimens belong to enantiornithines, a group of birds that dominated the skies in the Cretaceous period, but died out during the same great mass extinction that killed off the dinosaurs 66m years ago. These are early birds, so they still had three fully-formed fingers with claws, like their dinosaurian ancestors, that could grasp branches in order to climb trees. In comparison, modern birds retain the three fingers, but they cannot grasp and have lost the claws. The specimens also tell us something of the moment these birds met their fate: small scratch marks visible in the amber suggest one of the little birds was scrabbling to free itself. The fact that only one wing is preserved in each case perhaps tells us something too: we can assume these tiny birds, each with stumpy wings that are little larger than a man’s thumbnail, were clambering about on tree branches perhaps in search of insects or fruit to eat. They blundered into the tree sap and their feathers became entangled. The more they struggled, the more their feathers became stuck, and as the amber hardened they could not escape. The rest of their bodies decayed and fell away, leaving just two pristine little wings preserved forever. Apart from this vivid vignette of life and death 99m years ago, these wings offer the hope of more such discoveries. When the Jehol birds were found in China in the 1990s, they revolutionised our understanding of the early history of birds. The chance of finding feathers and soft tissues from these times means palaeontologists can flesh out more details in their understanding of the earliest birds. This is important: birds today are one of the most successful groups of animals with 10,000 species. In terms of biodiversity and conservation of these species, we need to know why they are so successful. Campaign to Ban DGS Gaining Momentum?